January 14, 2019 – Hill Strategies released the awaited report on Canadians’ Arts, Culture, and Heritage Participation in 2016. 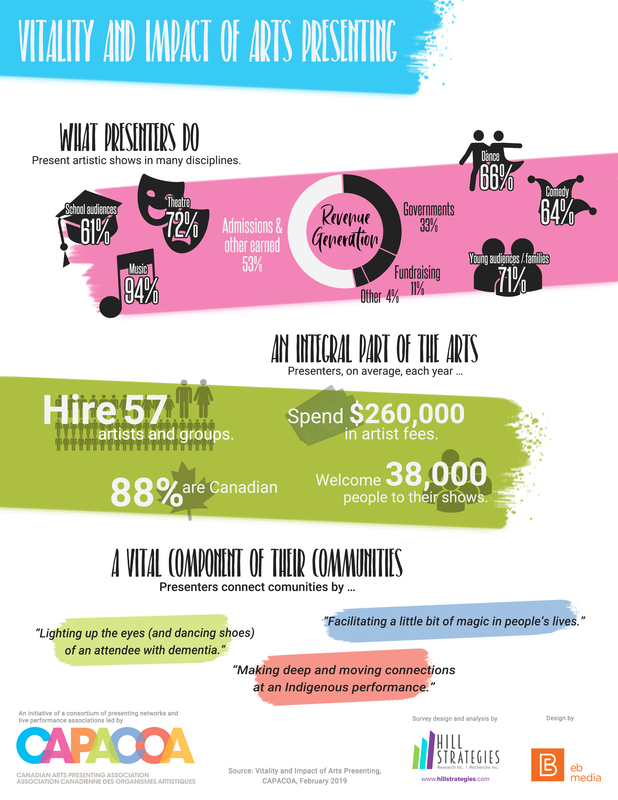 It found that about two-thirds of Canadians attended an arts performance or festival in 2016 (68%, or 20.0 million Canadians). This is much higher than in 2005 (49%) and slightly lower than in 2010 (72%), but changes in the questionnaire make it hazardous to draw conclusions. In general, a greater proportion of Canadians than ever sought out arts and heritage activities outside of their home. Two activities in particular have seen a strong and consistent increase over time: public art gallery attendance and historic site attendance. You may explore the report to find out how frequently Canadians attend specific disciplines and whether there was some increase or decrease compared to 2010. Further, the Statistics Cananada Survey of Performing Arts Industries revealed that the total number of performance grew faster than the total audiences in 2016, resulting in in a 3% decrease in the average number of attendees per performance compared to 2014.